A blackjack is a total of 21 in your first two cards. A blackjack is therefore an Ace and any ten-valued card, with the additional requirement that these be your first two cards.. The distinction is important, because a winning blackjack pays the player odds of 2 to 1 (3 to 2 in a real casino). A player blackjack beats any dealer total other than a dealer's blackjack, including a dealer's regular 21. If both a player and the dealer make blackjack, the hand is a tie or push. If the dealer turns an up-card of an Ace, he will offer "Insurance" to the players. Insurance bets can be made by betting up to half your original bet amount in the insurance betting stripe in front of your bet. The dealer will check to see if he has a 10-value card underneath his Ace, and if he does have Blackjack, your winning Insurance bet will be paid at odds of 2:1. You'll lose your original bet of course (unless you also have a Blackjack), so the net effect is that you break even (assuming you bet the full half bet for insurance.) 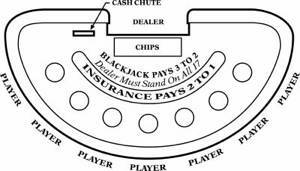 This is why the bet is described as "insurance", since it seems to protect your original bet against a dealer blackjack. Of course, if the dealer does not have blackjack, you'll lose the insurance bet, and still have to play the original bet out. The situation is often thought to be different when you have a Blackjack. The dealer is likely to offer you "even money" instead of the insurance bet. This is just the same old insurance bet with a simplification thrown in.